Bucco capensis Linnaeus, 1766, Cape of Good Hope; error = the Guianas. Monotypic. French: Tamatia a collier; German: Halsband-faulvogel; Spanish: Buco Musiu. 7.5 in (19 cm), 1.6-2.2 oz (46-62 g). Dumpy, with large head and short tail. Sides of face bright orange; rest of upperparts rufous, finely barred darker. Complete black collar forms band across chest, bordered buffy on nape. Underparts white, grading to rich buffy on lower flanks. Bill robust and orange; eye orange. 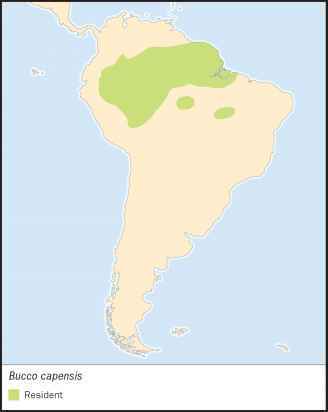 Widespread in Amazon basin from eastern Ecuador and southeastern Colombia; east to southern Venezuela, the Guianas and northern Brazil; south to southeastern Peru and northern Mato Grosso. 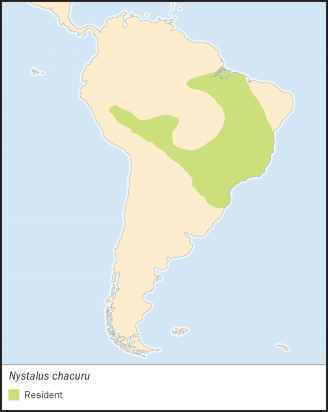 Lower to mid strata of tall humid forest, also dry hilly country, bamboo bordering rivers, and varzea; 0-5,580 ft (0-1,700 m). Still-hunts from horizontal perches; inconspicuous and tame. Distinctive vocalization given mainly before dawn. Large insects (beetles, orthopterans, cicadas) and small vertebrates (lizards, snakes, frogs) taken from ground or foliage. Excavates nests in arboreal termitaria. Not threatened. 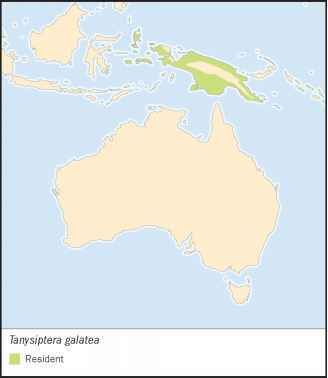 Uncommon (or at least infrequently observed) but widespread, occurring in several protected areas.